﻿The Broadway Bound Vista Theatre Project brought everyone's favorite beagle to the stage when it presented the musical SNOOPY!!! July 22-31 at M Space, 530 Lady Street. Remarkable! Fantastic! Entertaining! SNOOPY!! !, the follow-up to You're a Good Man, Charlie Brown, deserved each of its three exclamation points. Based on the world-renowned “Peanuts” comic strip, SNOOPY!!! delighted audiences with its familiar characters and toe-tapping songs. With a book by Charles M. Schulz Creative Associates, Warren Lockhart, Arthur Whitelaw and Michael L. Grace, this perfect show for all ages featured music by Larry Grossman and lyrics by Hal Hackady. SNOOPY!!! provides a dog’s-eye view of the "Peanuts" pals. Day in and day out, Snoopy looks upon the world from atop his doghouse. But this precocious pooch wants to kick up his paws and dance, go to school, write the world’s greatest novel...and much, much more! 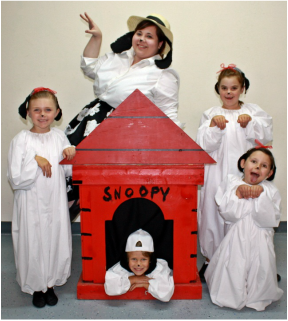 Ed Davis played the title role as the wildly imaginative, supremely confident, world-famous canine, joined by Parker Mustian as Charlie Brown, Tucker Privette as Linus, Mattie Mount as Peppermint Patty, Dani Wolan as Lucy, and Olivia Timmerman as Sally, with Shilah Lawson and Isabella Wolan alternating as Snoopy's feathered friend Woodstock. Along with an ensemble of familiar Peanuts faces and a litter of adorable puppies, this cast of local "veterans" and newcomers was guaranteed to entertain as they presented "The World According to Snoopy"! SNOOPY!!! was directed and choreographed by Dedra Daniels Mount, with musical direction by Shelby Sessler and Hannah Mount. A silent auction of "Peanuts" items was held before each performance as a fundraiser for the Broadway Bound Vista Theatre Project, a non-profit community-based musical and dramatic performing arts organization created to present quality family entertainment and to provide opportunities for children and adults to develop talents in all aspects of theatre arts. SNOOPY!!! was sponsored by Ken & Cheryl Wheat, Michelle Wang, and Davis Orthodontics. Performances were 8 p.m. July 22-23 and 29-30, and 3 p.m. on July 24 and 31. Tickets were $15.